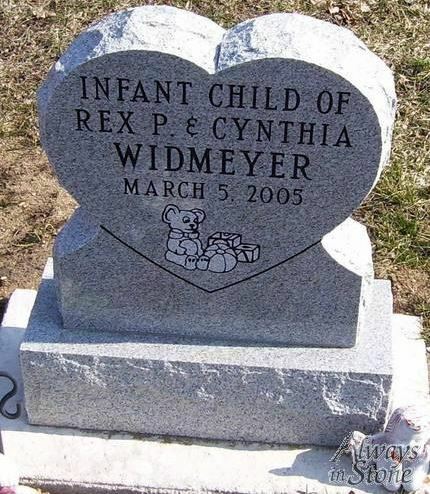 Many times parents struggle with the design of an infant headstone. How can any epitaph fully memorialize a little one? Yet, an infant headstone can have great meaning and provides a way to remember a life lost too soon. One thing to remember about infant headstones is that they are often smaller than an adult’s grave marker. However, this does not necessarily have to be the case and depends on the size of the plot and the placement of the stone. Typically, people choose infant headstones in either of two types of material. Bronze infant headstones are cast so that the design is raised from the surface. When purchased, the background is usually painted a dark color so that the design contrasts and shows clearly. The issue with bronze headstones is that over time, the bronze will patina and the contrast between the design and the background lessens. This can make them hard to read. Granite headstones are the most common. They are both economical and last for many years without deterioration. The granite comes in a variety of colors including shades of blue-gray and pinks. After you select a stone, it is sandblasted and then the design is etched on the surface. This design can include both images and words. One of the most popular themes for infant headstones involves angels. This could be a small cherub sleeping on a cloud or a guardian angel watching over the child’s resting place. You can also consider other image choices such as small toys, teddy bears, or Jesus holding a child. All gravestones show the name and dates lived. When lettering an infant headstone, parents can choose to use a nickname or the full name for more formality. If the infant was stillborn, then the birth and death date is traditionally represented as a single date on the memorial. Because infant headstones are usually smaller than an adult’s, it can often be hard to fit long epitaphs on the stone. Consider using short phrases above or under the child’s name. An epitaph is optional and should be meaningful to the family. When you are ready to design your infant headstone, the first step is to decide what you would like on the grave marker. Once you have the inscription and any pictures you want etched, then visit Always in Stone and select your piece of granite. Their design specialists can help you refine your design or even help you create one if you are at a loss. Once the design is approved, they will etch the stone and then deliver and install it for you at the grave site.